MedForward has enhanced the overall user experience for our HIPAA-compliant online forms program. Support for managing larger numbers of forms. Zip file downloads of attachments and form groups. Customize confirmation e-mails for each form. MedForward has improved the online forms interface for user administration. Addition of a notification management page for each user. Automated e-mail notification administration for certain user modifications. 7/19/2018 MedForward Wins Clutch Award. Every year, Clutch releases the results of their extensive research ranking companies across numerous service offerings. The conducted research aims to measure the integrity of client-firm relationships in attempt to match potential business decision makers with the tools needed to make better partnering decisions. We are excited to announce that MedForward has been recognized as a leading service provider in Nashville in multiple service offerings. 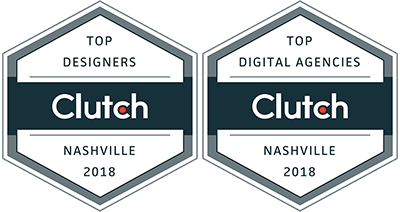 More specifically, Clutch named us a top web design firm in Nashville as well as a top internet marketing company in Nashville! MedForward’s new video features the benefits of switching to HIPAA compliant secure online forms. improvements to field auto-population for a better patient experience. recognition as a growing employer in the Nashville area. The pain diagram support is a great new feature for Orthopedic offices or chiropractors. It allows the user to create a set of custom brush types for different types of pain. Please contact us for a demo. To enhance the security of your systems and computers, MedForward is pleased to offer a service you can install on your computers and add to web services which adds a second layer of authentication (2FA) to login so that remote connections can be secured. Please contact us for a complimentary trial and pricing information. Whether you run a dermatology practice or a dental office, creating a way to manage patient processing online can save you time and headaches. That’s why, to streamline your patient intake, you need to choose the right secure, HIPAA-compliant option for checking in your patients. Here’s a look at two options available to you, as well as tips for deciding on which is best for your needs. Virtual PDF Forms: We have the ability to fill out and sign a document as a virtual fillable PDF, using pdf.js library. HTML Documents: We can have the form be fillable as a responsive or traditional HTML document, and the completed form as a custom matching PDF or dynamic PDF. If your document contains a lot of text or it's important how it matches your current form when filled out, we recommend the fillable PDF mode. If your document is only important how it appears when completed, then we recommend fillable HTML mode. If your document changes very often, we recommend HTML fillout with a dynamically generated PDF file. Save on the expense and time of mailing paper forms. Deliver them more timely. Have a way to e-mail patients a link to the forms. Let patients access the secure online forms from the website. Still have the option to use a paper system if you desire - you can print the completed PDFs from patients. Or, you can skip scanning them, avoid hard-to-read handwriting and streamline office process. Are you interested in learning more about secure online forms and how they could improve your practice? Contact us today to talk about it! Local Search Is More Competitive Than Ever. Because of the potential power local searches offer (leading up to 50 percent of mobile visitors to physical locations within 24 hours), earning those coveted top placements is getting harder and more competitive. Local search packs in the SERPs show fewer listings, meaning you have to rank in the top few if you’re going to be seen. On top of that, the results that rank highest are dominated by Adwords Ads, enough so that if your ad is not in a top three ad positon for a related search, chances are you won’t be seen by potential patients. Organized Data Matters. Recent Google updates have made search results with rich snippets very important; that term is used to describe structured data markup that site operators add to their existing HTML, and are going to rank higher in the days ahead. Mobile Matters. In a world increasingly dominated by smartphones, it’s no surprise to say that mobile matters but it’s going to matter even more in 2016. Now is the time to make your website mobile if you haven’t already—with a large percentage of users accessing websites on their mobile devices, there’s a huge segment of the population to be reached. If you want to discuss getting your website mobile, contact us today to start the conversation! In 2016, MedForward expanded our secure online forms solutions to include some exciting new features. These features include the ability to map your responsive HTML form to a custom PDF form. Also, patients can now fill out a form in a fillable PDF format. MedForward Forms also now support an ink style signature. If you're interested in adding these features to your current forms, please give us a call or contact support@medforward.com. Say you were at Starbucks going on Facebook and a hacker wanted to get your login info—if Facebook didn't have an SSL certificate, it'd be pretty easy for that hacker to take your password and use it to pretend to be you. Or maybe you're shopping online and giving your credit card number on a site—if that website weren't secure, a hacker would have no problem grabbing your information and using it to make purchases in your name. That's why SSL certificates are so important. They are what enable an encrypted connection that makes personal information safer and harder to hack. What does an SSL certificate do for a website? In today's Internet world, security is vital. If you're dealing with any personal information, you need a way to secure it. While an SSL connection can increase the cost of hosting a website, it is absolutely worth it for e-commerce sites, businesses that process transactions online and sites transmit any sort of personal data. When you're on a website, the easiest way to know it's secure is to look at the URL. The https:// connection lets you know that you are connected to a secure website. Note, however, that not all SSL connections are the same. There are different methods for protecting a connection and different companies that perform the verification process. To show this to users, browsers sometimes have other identifiers, like a padlock on sites you're viewing on Safari or a URL highlighted in green when you're viewing it on Google Chrome or Internet Explorer. These extra measures can indicate a more extensive verification process was involved. In light of recent massive security breaches of government employee's information, MedForward wanted to share with you several tips that could help you maintain secure data and protect your information. In total, it has impacted an estimated 21.5 million employees. - Deploy intrusion detection systems. - Focus on setting up processes to avoid employees being tricked into revealing key password information. - Make sure the best anti-malware and anti-virus solutions are in place. - Provide adequate training to all staff on IT security. This breach is an example of both cybersecurity and HIPAA security’s increasing importance. The penalties imposed by the government for such security breaches are getting higher and higher, with hopes that these will help make companies more aware of the importance of securing patient’s data. Data encryption at rest (which MedForward offers) was not in use for this breach and is very important. The new year brings new changes to Google and other search engines' algorithms. Staying on top of the best SEO practices is one way to help your practice's website rank well in search results. Focus on semantic search instead of keyword search. Instead of plugging in excessive keywords on your page, focus on user-friendly content that answers popular questions about treatments and procedures and offers expert advice on your topic. Target local SEO. Don't overlook local SEO opportunities such as Google My Business for getting your name out to new patients, particularly those searching from mobile devices for services in their area. Build relationships, not links. Whether you're building relationships with your patients who in turn leave positive reviews or connecting with other experts in the field that may link to you from their website or blog, these relationships carry much more value than hundreds of links from less reputable sources. Focus on mobile-friendly content. With the growing number of mobile users who use their smartphones and tablets to browse the web, it's important to keep your site mobile-friendly by optimizing the design for mobile devices and avoiding technologies -- such as Flash animations -- that may not work for all visitors. 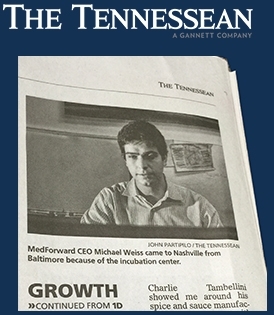 MedForward CEO, Michael Weiss, was recently interviewed in The Tennessean's article "Nashville Incubation Center quietly fosters companies' growth" by Jamie McGee. The article discusses current businesses in the incubation center, including MedForward, and past businesses from the incubation center that have grown into successful companies. Google's latest set of algorithm updates continues to alter sites' rankings in an attempt to maneuver the highest quality sites to the top. Google has also made changes affecting local rankings to help users find more relevant local results. Clearly communicating your practice's location through your website and social media, as well as keeping your site populated with timely and useful content can help keep your site ranking on the first page for relevant keywords, for both local and wider spread audiences. What Constitutes a High-Ranking Website? Trust-worthy, accurate information on your topics such as cosmetic procedures or medical conditions. Site layout that is easy for both human readers and search engines to navigate. Interesting content that readers find relevant and would want to share with others. Quality links from high-ranking websites pointing to your site or webpage. How Does Google Judge Local Ranking? Ensure the practice name or doctor's name, address, and phone number are displayed on important pages, such as the home page and contact us page. Add contact information to the footer so it will be easy to find from any page on the website. Keep all social media channels up-to-date with the latest contact information that matches the website. Fill out social media profiles as completely as possible with contact information, business hours, and a description of your services. Encourage patients to post online reviews of your practice. Need help with search engine optimization or social media marketing? MedForward offers a variety of SEO, online marketing, and content management strategies to improve your website and attract more patients. 6/13/14 - Is HIPAA Antiquated? MedForward was recently named among the Top 50 Web Designers in Nashville on Up City. Read the full article here. MedForward has recently added the option for our secure online forms users to export patient form submissions as a CSV file to help integrate the data with the user's current system. Our system now supports viewing patient submissions as an HTML file, downloading the submission as a PDF, and exporting submission data into a CSV file. Learn more about our secure online forms program. MedForward attended the Tennessee Medical Association's "Bringing Medicine Together" meeting April 24-27 in Franklin, TN. The conference focused on bringing together medical professionals from across the state to address the many changes and challenges in healthcare today and to improve healthcare quality across Tennessee. Doctors can now share their knowledge and expertise through videos featured on RealSelf's latest feature: RealSelf TV. RealSelf is one of the most popular resources for patients to find reviews of treatments, procedures, and doctors in their area. Social media is an excellent way to connect with current patients and grow your practice, but it poses several unique challenges for physicians. Find out how your practice can overcome common roadblocks to grow your online presence. MedForward continually strives to emphasize the importance of properly implementing HIPAA requirements. A Massachusetts-based medical practice has agreed to pay over $100,000 in fines for HIPAA violations after an unencrypted thumb drive containing electronic protected health information was lost. An investigation found the practice lacking in policies and procedures addressing breach notifications as required by the Health Information Technology for Economic and Clinical Health (HITECH) Act. Practices can learn more about the Breach Notification Rule through the U.S. Department of Health & Human Services. Google now offers HIPAA compliance for its Gmail and Calendar apps, providing security for businesses dealing with electronic protected health information (ePHI). Google Apps administrators of business, education, and government domains can request a business associate agreement (BAA) with Google before they begin use of Google’s services. With more and more practices storing and sending medical information digitally, HIPAA compliance is crucial to protect patient data. Medical practices should always verify the vendors they use are HIPAA compliant. Contact MedForward today to learn how your business can save time and money by switching to our secure, HIPAA compliant online form system. A bad online review can really hurt your business. It's important to respond to these reviews in a neutral, professional format, and invite them to contact you so you can correct the situation. In addition, many happy patients will not go out of their way to write a good review, so the bad reviews can be disproportionately represented. To counter this, we recommend creating a guide to give patients that includes instructions on how to provide an online review on RealSelf, Yelp (if the patient is active on Yelp or it will get filtered), Google, and any other applicable channels. And, have your patients take a satisfaction survey immediately after each visit so you can make sure you address any potential issues sooner rather than later. Patients may not always share how they feel with you if they are upset. Asking them can be a great way to start that conversation and resolve a mis-communication before it turns into a negative online review. We have seen great success with our clients taking advantage of RealSelf. It's social network designed specifically for cosmetic procedures and as a result has the highest ROI we have seen from marketing budgets items to date, when used properly. Your deadline to update your HIPAA materials is today, September 23rd, 2013. This rule also expands upon the roles and responsibilities of Business Associates, such as MedForward, Inc. Please make sure you research this rule, update your privacy practices, and make sure your IT security is up to the new standards. What are the latest trends in medical website design and medical online marketing? Physicians are increasingly adapting to changing patient behaviors. Patients want to do more through their doctor's website, including fill out forms, use a patient portal if one is available, or access their doctor's website through their tablet or smart phone. To adapt, physicians are making their websites responsive, adding important features, and adding secure online forms. In addition, website designs are including larger fonts as well as bolder and more creative color choices. Pictures and professional photography are playing a larger role in the design process. Videos and other types of multimedia are becoming increasingly common.